The founder and inventor of the worldwide web, Tim Berners-Lee, has repeated his call for a bill of rights or Magna Carta for the internet, and urged mass action to achieve it in the face of powerful opposing interests. 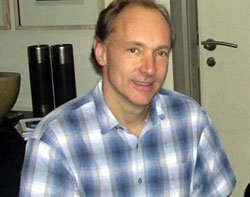 Berners-Lee first discussed his ideas for a global Magna Carta earlier this year, to mark the 25th anniversary of the development of the worldwide web at Cern and the launch of the Web We Want campaign. His concerns over the security of the web’s future arose partly in response to aspects of online life such as the growth of walled gardens run by ISPs or large websites, growing corporate influence and over-zealous government oversight and mass-surveillance revelations. Berners-Lee spoke at an event at the Southbank Centre in London which, together with his own Worldwide Web Foundation, is running the Web We Want festival later in 2014. He elaborated extensively on his concerns, and said he would like to see the foundations for a global Magna Carta in place by the end of 2014. “People have a feeling that they can’t trust that the web will have the properties that we trust in it in the next 25 years, or even in the next three years. There’s this huge corporate pushback, trying to eat away at these core principles,” he said. Berners-Lee also argued that a Magna Carta would help restore some confidence in the UK on the global stage, given the widely accepted complicity of British intelligence services in the NSA surveillance scandal. “What’s now in order to re-establish the UK as a place to do business, as a place to store data is a system that has checks and balances, as the Americans say, that has oversight,” he said. Berners-Lee urged the building of a worldwide consensus on such a bill of rights sooner rather than later, saying that, in an ideal world, he would want to have a high-level, global Magna Carta and a plan to implement it before the end of 2014. “Our homework as Brits is that, by the end of the year, we’ve got to plan so that we know how to work it, so that we know a list of laws we’re going to have to introduce, or laws we’re going to have to tweak. We’re going to have to get some government structure and oversight, and maybe some regulation when it comes to ensure net neutrality with specific powers given to specific agencies,” he said. The event on 7 May 2014 brought together a range of interests from artists, non-profits, webmasters, journalists, analysts and even politicians, to brainstorm over the future of the worldwide web and ultimately help decide on the programme, look and feel of the Southbank Centre’s upcoming jamboree. The Web We Want festival will run over three weekends, between September 2014 and May 2015, covering the themes of web freedom and openness, online creativity and learning, and the future of the worldwide web and how to ensure that 25 years from now, it remains true to Berners-Lee’s original vision. Southbank Centre artistic director Jude Kelly said: “The web is vitally important to all of us and needs to both be fully understood and protected for all it can achieve, but presents particular opportunities and challenges to women, young people and those in developing economies and will continue to transform our world in ways we cannot yet fully imagine. The festival organisers will be working with a number of other bodies such as the British Library, which is preparing to celebrate the 800th anniversary of the signing of the original Magna Carta at Runnymede in 1215.